the cows in the corn. that looks after the sheep? 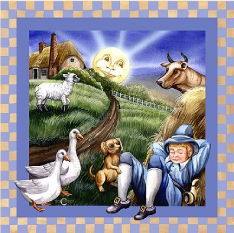 Little Boy Blue is a popular nursery rhyme poem for children and also makes a wonderful theme for a birthday. 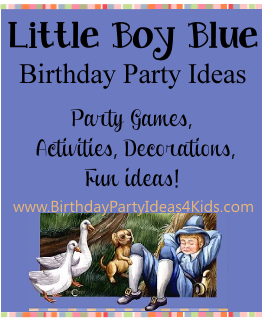 We've listed our favorite ideas, games and activities for the Little Boy Blue theme. Choose which ideas work best for you and use them to plan the perfect child's party! Simple solid blue invitations with party information written inside. Print out party information onto blue cardstock (several can fit onto one sheet) about the size of a small index card and attach to a plastic toy horn with yellow or blue ribbon. Invitations printed with a meadow or old time farm scene. For fun place a few straws of hay in the invitation. Decorate in 2 or 3 shades of blue with touches of yellow (for the haystack). Attach blue and yellow helium balloons to the mailbox to let guests know where the party is located. Scatter hay along the entrance to the party. Make signs out of poster board or cardboard that say "Sheep Meadow" , "Corn Field" and "Haystacks" with arrows pointing in different directions. Decorate the party table with blues and yellows. Solid blue tablecloth or a light blue gingham tablecloth with yellow tableware. Place a few small hay bales (these can be bought at craft stores) on the party table. Bandanas can be used as place settings or to wrap up the flatware. Hayride - Hayrides are always fun and children love them. Use a traditional wagon pulled by a horse or tractor or make your own hayride from a large wagon or wheelbarrow filled with hay and give the guests rides one or two at a time. Petting Zoo or Pony rides - Some petting zoos have farm animals that they will bring to the birthday. Cows, bunnies, chickens and goats - kids love them! Set up a table at the party so guests can sign a picture mat (that you can later use to mat the birthday boys picture) or a scrapbook page for a special memento from the party. Ask guests to write a small blessing, poem or favorite memory about the birthday child. Fill a big container like a kids swimming pool with hay, raffia, shredded newspaper or Styrofoam peanuts. The "needle" (never use anything sharp!) could be toys, candy or little plastic sheep and cows. Hide the toys and candy in the "hay" and have kids search for the items. Little Boy Blue Treasure Hunt - Hide lots of plastic farm animals (or cut out sheep and cows from cardboard) around the party area, backyard or park. Send out party guests to find the lost farm animals. Let the guests keep what they find, or bring them back to trade for a prize. You can also write a number on some (or all) of the animals and when they find one they can trade it in for a prize that corresponds to the number on their animal. As a fun activity during the treasure hunt give each child a little horn that they can blow when they find an animal.